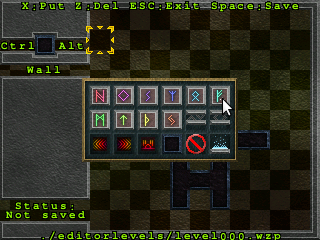 Keyboard, mouse and touchscreens control the prettier-than-ever, polished retro puzzle Wizznic!, which is 100% GPLv3 and available as a GitHub project. Last release (0.9.9): ~six months ago. Last commit: one day ago. Before Wizznic 1.0 we will create two completely new themes, each for it's own pack, thus, two completely new packs! That is 40 new puzzles, leaving the mainline puzzle set at 80 puzzles. Anyway, just wanted to say, in this in-browser, Object Oriented, Accelerated, flashy, highres, 3D world, that little pixel pushing Wizznic is not dead! Quoted from "Wizznic work", 2012-06-05. OverDose now officially... hmm?... open-source? Liberated Pixel Cup is a go!